Anthony Pearson (b. 1969, Los Angles, CA) has produced works of multiple disciplines throughout the span of his career. Having begun as a fine arts photographer, Pearson eventually went on to focus more on material-based works that can neither be called a painting nor a sculpture in entirety. 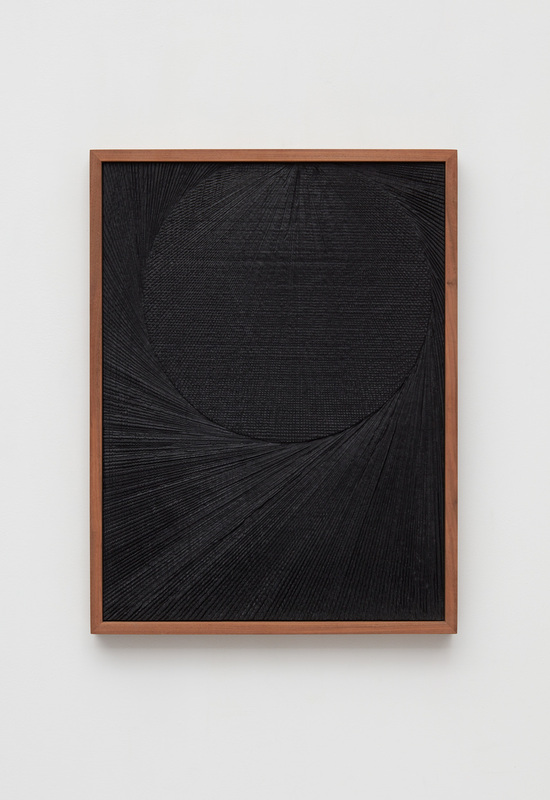 These wooden-framed reliefs Pearson refers to as “Embedments” are made using liquid hydrocal (clay, plaster, or bronze on other occasions), which is poured into frames stretched with fabric. Letting gravity do its work, the gypsum cement in its liquid form takes on a shape of its own, the differently tinted layers oozing over and around each other within the boundaries of the frame. Once dried and set, the piece is flipped over to remove the fabric underneath, revealing the remaining imprint. Instead of focusing too much on the image itself, Pearson intuitively manipulates the material to challenge the boundaries of distinct art forms, merging the different disciplines of paintings and sculptures to create a new medium that serves as a haven from today’s obsession with blatancy and immediate gratification. The subdued manner of his works casts a sense of serenity around the space in which they are exhibited; while the eye dulled by flagrance may pass by without noticing, the perceptive who are willing to deliberate over each piece with meditative contemplation can appreciate the positive and the negative of space and light within his works. Born in 1969, Pearson began his artistic studies at the California College of Arts, where he received his BFA in photography in 1996 and later an MFA at UCLA in 1999. Although having practiced photography for many years since, Pearson found the images unsatisfactory, claiming that “the intensity of the real world was never accurately rendered in [his] photographs.” As a result, Pearson began to transition towards sculpture, which he displayed alongside his photographs in exhibitions such as “William Obrien/Anthony Pearson” at Marianne Boesky Gallery in New York, NY in 2007. Solo exhibitions since then include David Kordansky Gallery, Los Angeles, CA, Midway Contemporary Art, Minneapolis, MN, Shane Campbell Gallery, Chicago, IL, and more. His works are included in public collections of The Hammer Museum, Los Angeles, CA, Walker Art Center, Minneapolis, MN, Art in Embassies, Washington, DC, Museum of Contemporary Art, Los Angeles, CA, and Los Angeles County Museum of Art, Los Angeles, CA. Pearson currently lives and works in Los Angeles, CA. Anthony Pearson은 끊임없는 자기 변모를 겪으며, 다양한 분야의 작품을 다루어 왔다. 사진으로 시작한 그의 작업 세계는 물질 혹은 재료 자체에 기반을 둔 작품으로 변화해가는데, 이런 그의 작업은 회화 혹은 조각이라고 이분법적으로 단언하기 어렵다. Pearson이 천착하는 것은 회화와 조각의 ‘사이’, 그리고 예술 양식의 ‘경계’이며 작가는 그 틈을 능수능란하게 오가며 독창적인 작품 세계를 열어 보인다. 작가가 ‘매립’된 것들이라 칭하는 <Embedment> 연작은 그 틈과 사이의 예술을 가장 잘 보여준다. 목재 프레임으로 둘러진 부조 작업으로, 주로 석고의 한 종류인 액체 하이드로칼을 이용해 제작되며 경우에 따라 점토, 석고, 혹은 청동의 재료로 변주하기도 한다. 천을 씌운 프레임에 액체 석고를 붓는 과정을 거치며, 석고는 매끄럽게 흐르거나 층층이 퇴적되며 자연과 우연의 결과들이 프레임 곳곳에 자리잡게 된다. 다양한 색채의 석고 층이 서로 겹치고 흘러내리면서 화면을 완성하는 것이다. 시간이 지나 건조되는 과정을 거치면서 작업은 가변적인 유동성에서 고정된 결과의 세계로 이행한다. 이후 초기에 프레임에 설치된 천을 제거한다. 이 과정에서 석고에 스며든 자국들과 찢겨지고 남은 천의 가닥들까지 작품의 일부로 습합된다. 이는 가장 흥미로운 지점으로, Pearson의 작업은 결과적으로 회화와 조각의 사이 그 어디쯤에 위치하게 된다. 회화적 화면이기에는 다양한 질감과 양감으로 넘쳐나며, 조각이기에는 평면적인 것이다. 뿐만 아니라 단독 재료의 매끄러운 표면 대신 천이라는 물질의 흔적이 남아있으며, 작가는 제작 과정을 감추지 않고 드러내 보인다. 이처럼 Pearson은 회화와 조각의 사이, 과정과 결과의 사이, 그리고 작품과 재료의 사이를 치열하게 탐구한다. 이미지의 의미 보다는 재료 자체에 집중하여, 이를 직관적으로 다루고 변주함으로써 미술 형식의 경계를 넘나든다. 작가가 회화와 조각의 다양한 규범과 특징을 시험한 끝에 새로운 자기 경험을 통해 제안하는 것은 틈과 사이에 위치한 새로운 매체다. 동적인 제작 과정과는 역설적으로, 그의 작품은 차분한 색조에 명상적 분위기를 자아낸다. 이는 개별 작품 뿐 아니라 주변의 전시 공간까지 고요로 물들이며 전시 자체를 틈과 사이의 공간으로 탈바꿈시킨다. 관람자로 하여금 사색으로 인도하여 공간과 빛, 그리고 그의 작품이 자아내는 음과 양의 면모를 감상할 수 있도록 한다. 공간과 작품 사이, 그리고 작품과 빛의 사이에서 관람자 역시 그 틈을 만끽하는 명상적 경험을 거치게 되는 것이다. 이처럼 그의 작품은 양감과 자국, 그리고 물질의 혼합체이며 빛과 전시공간에 의해 얼마든지 가변성을 지니는 가능성의 매개가 된다. 무엇보다 Pearson의 작품은 그 기법과 외양, 그리고 감상의 순간까지도 여러 경계의 사이에 위치해있다. 여러 틈과 사이에서 치열하게 공명하며 스스로의 빛을 찾아 낸다. 1969년 출생한 Pearson은 California College of Arts에서 수학하여 1996년 사진으로 BFA 를 취득, 이어 1999년에는 UCLA에서 MFA 를 취득하였다. 사진을 전공하고 초기에는 사진 작업을 중점적으로 진행하였으나, “실제 세상의 강렬함이 (그의) 작업에 정확히 담기지 않음”을 통감하며 조각으로 작업 방향을 선회한다. 이는 2007년 뉴욕 Marianne Boesky Gallery에서 열렸던 <William Obrien/Anthony Pearson> 2인전에서 그의 사진 작업 옆에 조소 작업을 함께 전시하는 것으로 선보인 바 있다. 이후 꾸준히 회화와 조각의 경계를 탐구하며 다수의 개인전 및 그룹전을 진행하였다. Midway Contemporary Art(Minneapolis, MN), Contemporary Art Museum(St. Louis, MO), Drawing Room(London, UK), Los Angeles County Museum of Art(Los Angeles, CA), Columbus Museum of Art(Columbus, OH), deCordova Sculpture Park and Museum(Lincoln, MA), Aspen Art Museum(Aspen, CO) 등에서 전시하였다. 그의 작품은 The Hammer Museum(Los Angeles, CA), Walker Art Center(Minneapolis, MN), Museum of Contemporary Art(Los Angeles, CA), Art in Embassies(Washington, DC), 그리고 Los Angeles County Museum of Art(Los Angeles, CA)의 컬렉션에 소장되어 있다.